On Bona Ludo I already wrote about Halatafl or “fox and geese” – a game from Iceland. I mentioned this is old game so there are many variants. Now the time has come to describe these variants and game of Freys-tafl is good starting point. In short, I’ll remind you the rules of Halatfl. The game is played on a board as shown below. Lines intersections are points, on which you can place pieces. On the image below you can see pieces in initial setting. One player plays with one white pawn (so called “Fox”). The second has many black pawns (so called “Geese”). 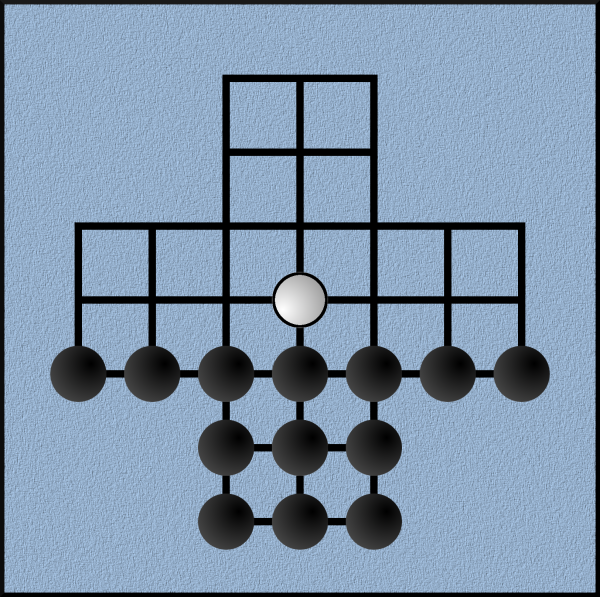 Each player in one turn can move his pawn to adjacent field joined by a line. The Fox may capture geese by jumping over them, in a straight line, to the field behind them. Fox may capture several geese in one turn (if there are free fields behind them). Geese can not capture the Fox. Geese win if they block the Fox, so he could not make a move. Fox wins, if he kill all the geese. This is only a short description of the rules. If it’s not clear to you, see the my article on Halatafl. It describes the simplest, standard version of the game. More complex Halatafl variants use a different number of pieces, or a different board. The first popular variant uses four additional Geese. The image below shows how these Geese are set before the game begins. The rules of the game are just the same as in the standard version. The Freys-tafl is the name of the variant in which the board has additional diagonal lines. This increases the possibility of moving and makes the game more surprising. The image below shows the board and pieces in initial setting. You can combine both described variants of game. I mean you can use 17 “Geese” and Freys-tafl board. Then initial setting looks like this. If you to know more about similar games, see my other articles.